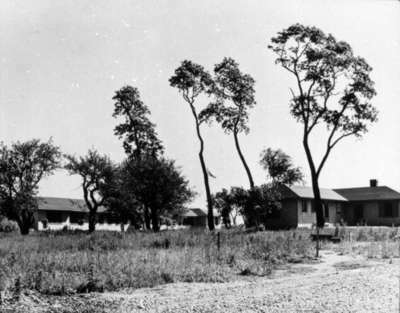 A black and white photograph of the Camp X buildings. Camp X was a spy training camp and communications centre established by British Security Co-ordination on the shore of Lake Ontario on the border between Whitby and East Whitby Townships. The camp operated from 1941 to 1945. It was used as a government communications centre until 1969. The buildings were demolished in 1971-1972. Camp X Buildings, 1942, Photographer Unknown. Whitby Archives 29-005-001.